This image shows a field of galaxies in the western portion of the Virgo cluster of galaxies. The Virgo galaxy cluster is a group of approximately 2,000 galaxies all gravitationally associated with each other. Our Milky Way galaxy's Local Group is part of this Virgo cluster. M86 (center) is a lenticular galaxy (a galaxy between an elliptical and spiral galaxy) and is one of the dominant galaxies in the group. 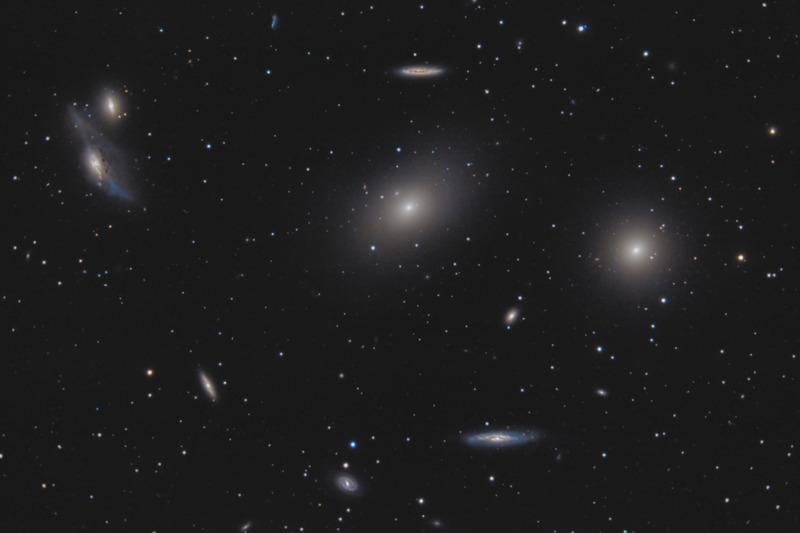 It is the primary galaxy in the M86 subgroup shown in this photo. M84 (to the right of M86) is another very large lenticular galaxy. Both M84 and M86 are giant galaxies and are believed to have masses on the order of 1 trillion suns each. The galaxies shown in this image are part of Markarian's Chain of galaxies. M84 is the westernmost galaxy in Markarian's Chain, and this image shows a field of about 1 x 2/3 of a degree of the western part of the chain. The remaining portion of Markarian's Chain extends to the northeast for another degree or so. Other major galaxies shown in this image starting at the 12:00 position and going clockwise are NGC 4402 (spiral galaxy), NGC 4387 (elliptical galaxy below and left of M84), IC 3303 (elliptical below right of NGC 4387), NGC 4388 (large spiral galaxy at 5:00 position), NGC 4413 (barred spiral at 7:00), NGC 4425 (barred spiral at 8:00), NGC 4438 (a peculiar galaxy that was probably a spiral galaxy which has been warped from its encounter with NGC 4435), NGC 4435 (barred spiral), and IC 3355 (irregular very blue galaxy at 11:00). While processing this image, I was able to identify a total of 63 galaxies in this image (although I cropped out a few before finalizing the image). In this image, North is up. This image is cropped to 88% of the original full frame. Software Used Images Plus 4.5 for camera control, calibration, stacking, digital development, Lucy-Richardson deconvolution, multiresolution sharpening, smoothing and noise reduction. Photoshop CS5 used for levels and curves, color balance, high pass filter, star shrinking, saturation adjustments, vibrance, selective color and noise reduction. Gradient Xterminator for gradient removal. Carboni Tools for additional saturation adjustments, noise reduction, and smoothing. HLVG for additional color correction. Notes I was very happy with the final result on this image, as its a fascinating field of view and I was able to capture very good detail and a lot of background galaxies. I hope some day to image the rest of the chain and create a mosaic out of it. This image was used in the May 2014 Galaxy Log video - a monthly video showing galaxies that are good for observing that month. This image was also published by Astronomy Magazine as its Picture of the Day for October 19, 2016!